Inside EVOlution 2004: Inside EVOlution 2004! Inside EVOlution 2004 is a documentary by Shankar Tablada. Shot in Pomona California on August of 2004. A 58 minute cut of the documentary premiered at the New York Independent Film & Video Festival in the fall of 2005. The original "Inside EVOlution" cut was edited in 2005, but later in 2009 re-edited to the now 47 min "Inside EVOlution 2004" version. Year after year hundreds to thousands of gamers throughout the fighting videogame community travel thousands of miles to compete against players from all over the globe, to display their skills and prove who is the best fighting gamer of that year. 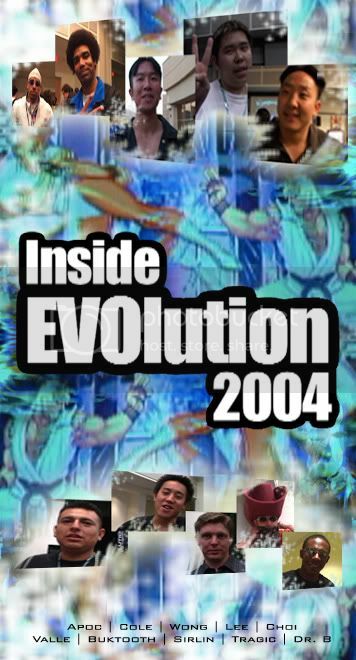 “Inside EVOlution 2004” goes behind the tournament scene to bring you exclusive coverage of matches as well as interviews from some of the most charismatic personalities in the “Street Fighter” gaming community. For the next hour put your controllers down and step Inside EVOlution 2004! Inside EVOlution 2004 from ShankarFilms on Vimeo. Apoc, Afro Cole, Justin Wong, Eddie Lee, John Choi, Alex Valle, Buktooth, David Sirlin, Tragic, Dr. B & many more! I have set up a pay pal donate button for those of you that can support this project. Anything is welcomed. Thanks again for the support! !